Time to dust this place off and give you some useful information. Like, for when you're headed to the pool and plan to drink 'ritas and read something awesome. 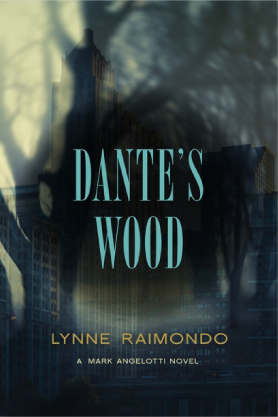 Try this: DANTE'S WOOD, by Lynne Raimondo. "Still reeling from a late-onset genetic disorder that’s left him blind, Windy City psychiatrist Mark Angelotti is assigned to assess Charlie Dickerson, a developmentally disabled youth allegedly molested by a teacher. "Just days after dismissing the allegation, Angelotti is shocked to learn that Charlie has confessed to the teacher’s murder. When the defense hires him to testify on Charlie’s behalf, Angelotti’s colossal ego rears itself in a sparring match with the prosecution that gravely wounds the case. "Motivated by guilt, barely acknowledged curiosity about the world of the disabled, and the aforementioned ego, Angelotti begins his own hunt for the killer." I was amazed to see a main character who's blind. Honestly, I didn't think Raimondo would be able to pull it off and so I was enthralled to see if she could. (I mean, your reader normally sees the world through your MC's eyes, so how the heck...?!?) And a murder-mystery blind MC???? Well, I was wrong, she was right. The characterization, actually, was one of the best things for me. The MC has just the right balance of bitterness, anger, hope, and resolve to really make him real. I was truly impressed. The plot, too, never let go of you. It's one of those where, part way through, you think to yourself, "Oh, wait, I think I know who..." and then ten pages further on you realize you were wrong, but think it all over again. As someone who tries to put a little of the location in my books, I also really appreciated some good glimpses of Chicago in the novel. Another thing that stood out to me, so well done. Her second book just came out, called DANTE'S POISON. That allows me to pay the author the best compliment I pay any series, which is to say that based on the excellentness of the first, I'm buying the new one. I suggest you do the same.